Saturday started out as a pretty miserable sort of day! The weather was not great and the husband had to make a delivery, after wondering aloud what I was going to do with the children he offered 'why don't you all come with me and we'll have lunch then find something to do?' well I was not going to pass a challenge like that, this being my favourite type of expedition; no planning, no expectations and no wondering if the weather will hold off. We were packed up and in the car quicker than he could say 'after you'! 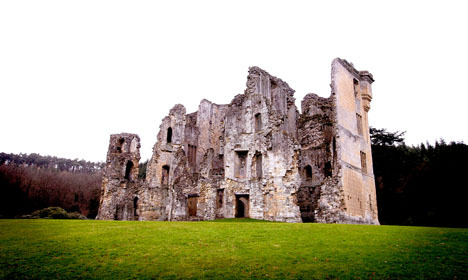 So that was how on a grey afternoon we found ourselves rambling around the wonderful Old Wardour Castle. Old Wardour Castle was built in the 14th century as a luxury residence for lavish entertainment (in the words of The English Heritage) and is surrounded by beautiful countryside it's a perfect place to enjoy a walk and even possesses its own grotto (yes a grotto, I was sold on that alone.) The children, particularly Oli, really enjoyed running free around the grounds and exploring the castle, the ruins of which are a labyrinth of winding stairwells and little chambers all waiting to be discovered. I love anything historical so this was the perfect afternoon for me and the children were full of laughter as they discovered chamber after chamber of hiding places, with not a plastic piece of play equipment in sight! After a few hours we were travelling back in the car with two rosy cheeked sleeping little ones - bliss.